As much as I don’t like politics, I confess that I do like politicians – in person, at least. One on one, pols of various stripes are among the smartest, most engaging people I’ve met while doing journalism. They’re articulate, their words are pointed, and they share the same off-center sense of humor that is found in most newsrooms. Susan Kennedy, Gov. Arnold Schwarzenegger’s chief of staff, belongs in that group. I photographed her in her Fairfax home for a Q&A with Marin Magazine. 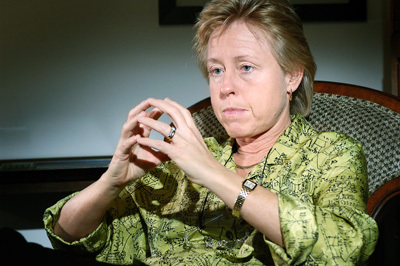 I have my issues with how she and the Governator are running California, but she’s someone you’d love to sit next to at dinner – intense, unflinching and intellectually persuasive. Plus, she’s twinkly. 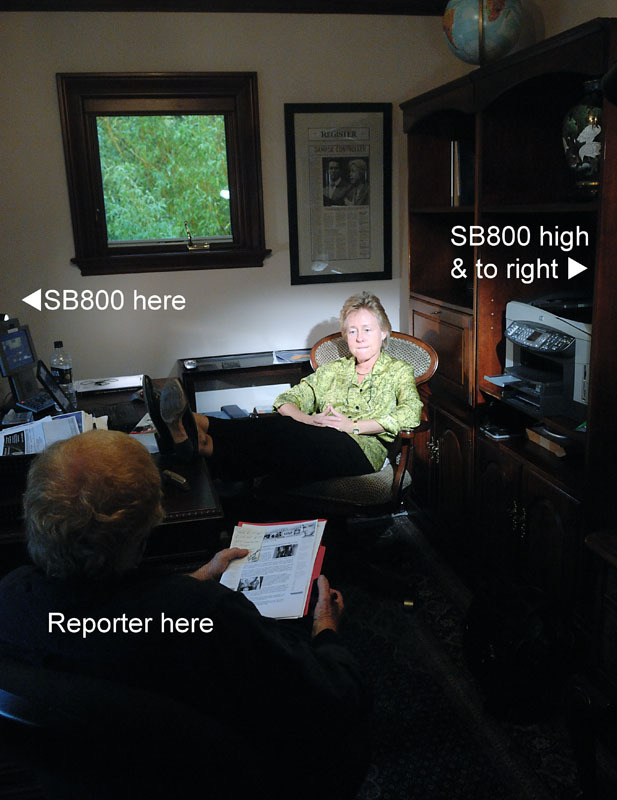 When I got to her house the reporter was about 30 minutes into the interview. They were in a small office, big enough for her desk and two chairs. There was window on one side with a bench in it, and I immediately decided to use for a post-interview shot. The rest of the room was dark. About 10 frames in, the clamp popped off the desk and it and the strobe clattered to the floor. The upside was that it loosened us all up; the downside was the $100 repair bill. I reset another strobe (didn’t you mother tell to always have a back-up?) on a stand, and began again. I shot for about 10 minutes more, listening to them talk, working the angles. I liked the light. It was strong, but tight. Nonetheless, I was looking forward to getting her by the window for some softer light. That wasn’t to be, though. Another five minutes and her phone rang (with the caller visible on the video-phone screen on her desk.). She was late for a meeting. By the time I stowed the gear, Kennedy was on the conference call. The lesson of the day is one I learned early on – both as a photographer and as a reporter: As soon as you enter the room (or the event or the whatever), start working. It may be your only chance. This entry was posted in On the Job, Photojournalism, Portraits and tagged Arnold Schwarzenegger, Fairfax, Journalism, Marin, Marin Magazine, Photojournalism, Susan Kennedy.